Southland RDA has held a place in the hearts of many Southlanders for more than 40 years. And there's not many people you'll meet whose family, extended family, friends or acquaintances haven't been helped by RDA somewhere along the way. Or they've stepped up to help as volunteers. 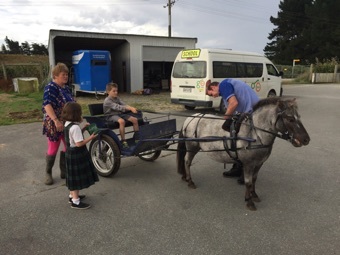 It is a place were both young and adult Southlanders can explore riding as therapy to help improve various aspects of their lives - from physical, emotional, mental and spiritual. Our volunteers who help our riders are vital to our organisation. The time they give so freely provides such a valuable contribution to our wider community, it would be impossible for us to thank them to the extent that they deserve. Currently riding every Tuesday from 9am until 2pm, Southland RDA is always on the lookout for willing hearts and hands to join us as we support our riders by creating opportunities to shape their lives positively. Delight getting harnessed and ready for his day's duties with our riders and their carers. 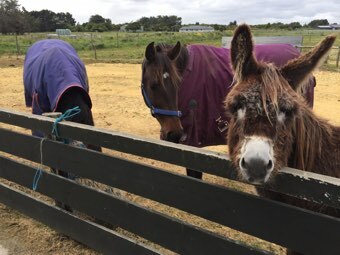 Sarchie, Zen and Quinn enjoying some hay in between rides at the RDA's Otatara based facility.